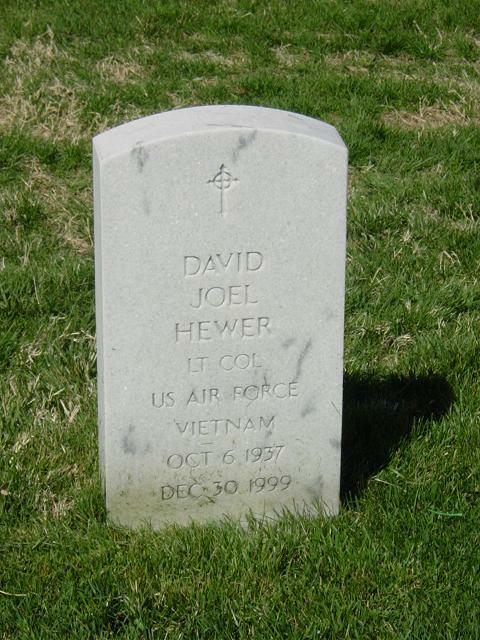 David Joel Hewer, 62, a retired Air Force lieutenant colonel who worked at two information technology firms in Reston, died of cancer December 30, 2000 at Reston Hospital Center, Virginia. He lived in Herndon since 1985. From 1995 until his death, Colnel Hewer was a vice president at ARTEL Inc., which he joined after six years as a program manager at Computer Sciences Corp. Colonel Hewer served in the Air Force for 29 years and was in Vietnam during the war there. He retired in 1989 from the Defense Communications Engineering Center in Reston. His honors included a Bronze Star, Air Force Commendation Medal, Defense Superior Service Medal and four Meritorious Service Medals. Colonel Hewer was born in Sault Ste. Marie, Michigan He graduated from Michigan Technological University with a bachelor's degree in electrical engineering. In addition, he received a master's degree in industrial engineering from the University of Pittsburgh, a master's degree in business from Webster University in Missouri and a bachelor's degree in computer science from Roosevelt University in Illinois. Survivors include his wife of 41 years, Geraldine Hewer of Herndon; two sons, Joel Hewer of Herndon and Thomas Hewer of Dayton, Ohio; a sister; a brother; and five grandchildren. on Tuesday, January 11, at 2 p.m., Fort Myer Chapel, with interment in Arlington National Cemetery with Full Military Honors. Memorials may be made to the Cystic Fibrosis Foundation.